This Forum is now closed - if you have an ongoing Project Log here you'd like to continue using, please PM "Epic Duck Mike" and he'll move it to another area. Alright. Completed army here I come! The final army will be 2000 points, but seeing as I have over 600 points finished, my goal will be to complete the other 1300 points. And I've got some work ahead of me. Here's the entire army list. 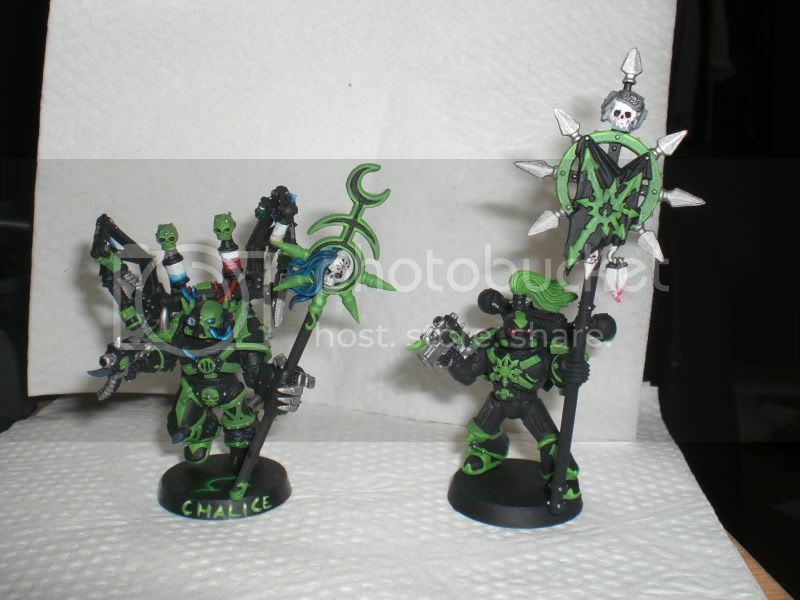 I have some big plans for the Chaos Sorcerer and Land Raider when I get them. I have some awesome bits that I'm going to use for conversions on both of them. 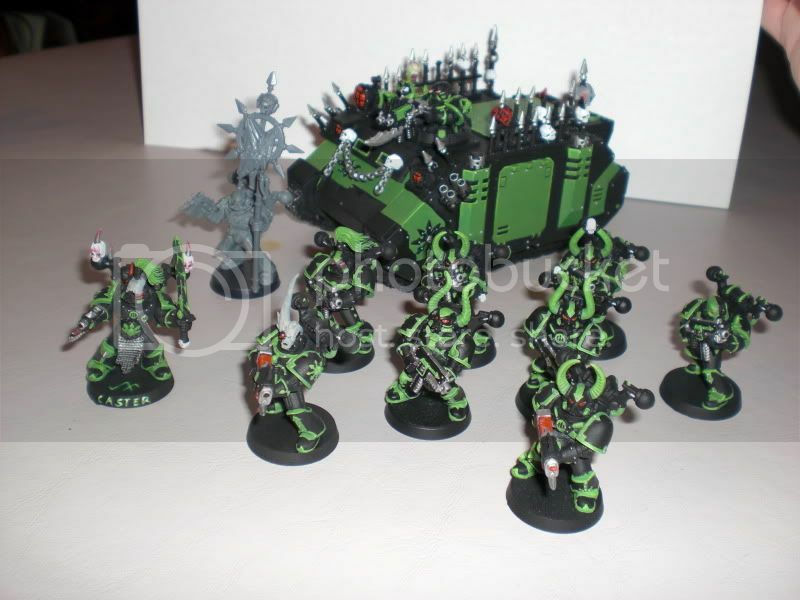 The Obliterators I'm going to convert from Chaos Terminators, and I'm waiting for the new Daemon Prince model to come out before I can make that, so expect that to be one of the last models I make. As for the Rhinos, I do have Rhinos, but they've been completely glued down. I'm getting the Renegade Strike Force (where most of this will hopefully come from) soon and I'll be magnetizing the Rhinos that come in that. That's what's on my plate, and I have this year to get it done. This year is important. If I don't complete this army by the end of this school year, I may not be able to properly sit down and continue it for a while. After all, I graduate from college after this, and I'll be going out into the big scary world. You can bet I'll bring my CSM with me, but it'd be really nice to get all of this done before next summer. That's my motivation! Last edited by DrBored on Sat Jan 02, 2010 12:25 pm, edited 23 times in total. Re: DrBored's Army Painter Motivational Challenge WIP Thread! Looking forward for some pictures DrBored! Whew, been chipping away at my Plasma Gun marines. Got almost all of them with the first coat and I've completed three out of the batch. My original plan was to make a new magnetized Chaos Rhino for that bunch, but seeing as I'd already painted an unmagnetized Rhino up beautifully with the upgrades that the unit needs, I decided to just use that, so it's in the complete section and that's a load off my mind. I look forward to finishing up my Noise Marine squad too. Just that one model and it's been taunting me. For now I'm content to work on the Plasma Gun squad and they're coming out very nicely. No pictures yet. When I get closer to completing my monthly goal I'll go ahead and post the update. I have a feeling it's going to be real close now! Alright, I built my Chaos Sorcerer! The bits that I wanted came in from GW, and instead of waiting for the Renegade Strike Force like a smart person, I went ahead, dumped out my bits box, and went through to see what I could make. I found some awesome pieces. I found the extra ammo box to my predator, the crystals that come with the Necron Lord w/ Res Orb, and a bunch of other spiffy pieces. But it wasn't quite enough. I didn't have a back piece or any legs. So, I ripped apart one of my Possessed that I stupidly built back a few months ago. When I say ripped, I mean ripped. The only thing remaining of it was the back piece and legs that I needed. A little fenangling and bam, I had a sorcerer! I'm still working on adding some sort of things that can represent wings, but it's slow going, and I'm definitely no good at green stuff. I can't even fill gaps properly, hah! But, pics soon to see what you all think. 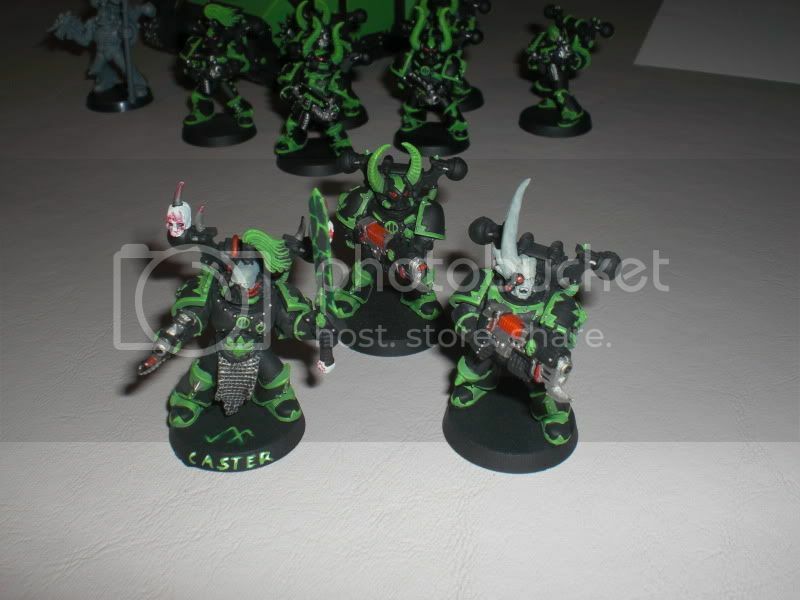 With including my Chaos Rhino and finishing 6 Chaos Space Marines, I've got 125 points, just 5 shy of my 130 goal. To get to that goal, I think what I'll do is finish GS'ing my Sorcerer and take a picture of the finished result, since she's going to be worth more than 130 points when she's completed. I forget where we're supposed to post those pictures though, to show that we've completed said month's deadline. Whew! Finally got those pictures you guys have been wanting! I finished all but one of the models for my plasma gun squad. I'm going to go ahead and post the picture of what I've done here, but I'll splice the squad and present less to fit roughly 130 points when the monthly due date is up. Here you have it, squad with accompanying Rhino! Head on over to my full journal below to see my new Chaos Sorcerer, update on pg. 6! Most of my army is now built. Still some GS work to do with the Land Raider and Obliterators, but otherwise it's off to priming for just about everything I received in the Renegade Strike Force. I still haven't built two of the Rhinos simply because I don't need them at the moment, but the one that I did build is nicely magnetized so the hatch stays shut and I can swap out the twin-linked bolter for a Combi-weapon. I also magnetized the Defiler at the... 'waist' so I could remove or turn the big top part. That way it doesn't take up as much vertical space when I put it away. Other than that, things are looking good. 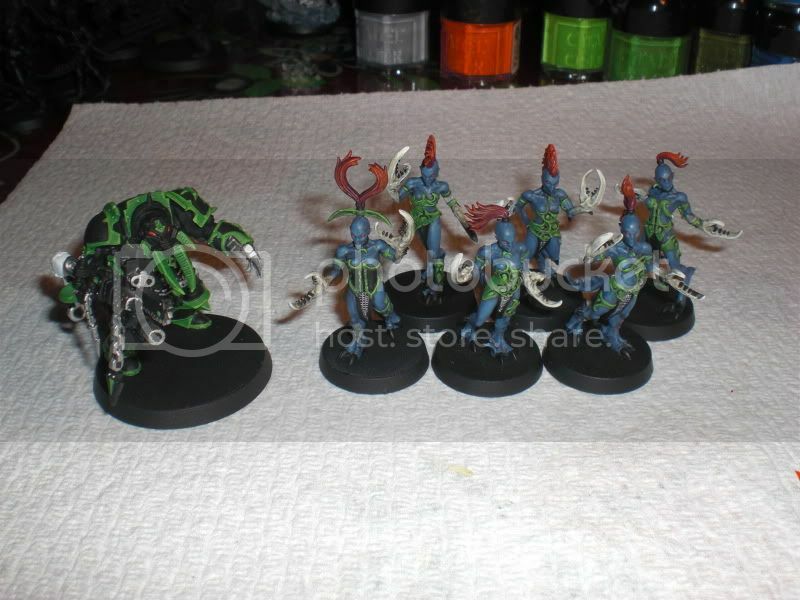 Once I have everything primed, I intend to paint the last in the squad of Plamsa Gun CSM and then my Chaos Sorcerer to finish the monthly due for August (due Sept. 14th) and after that I hope I can also find time to do the Group Build 9 Terrain piece I made and the Mini of the Month entry I put in. Got a lot on my plate this month.. conveniently, this is also the month I head back to college, so it's possible that /none/ of the three challenges will get done! I fiddled with my camera until I, by chance, discovered a setting that allows me to take pictures of food. As it turns out, 40k models are about the same size and require about the same detail as food, according to my camera, so the pictures have been coming out ok.
Fiddle with your camera settings. Fiddle, take a picture, fiddle, take a picture. If you have a digital camera, this should be much easier, and it might even have some preset options that work really well. If you have an older camera, you may not have those presets, but almost all cameras will be able to take 'macro' pictures, images where you need to come up real close. Once you've got the focus right, then there's the matter of lighting. I just use the flash on my camera, but to get better pictures you should have a lamp or two and a nice background (like a piece of corkboard) to take the pictures on. Once you've got the focus and the lighting, the next part is just making sure the camera is steady. I typically brace my arms against a desk or even my own hunched-over body if I have to, and breathe out while I take the picture, kind of like a sniper. Once you've got those three things down pat, and you still aren't getting the desired effect, you should take your camera in to wherever you bought it and return it! Hm! I am behind the times. The month of September has been a particularly busy month, and I've completely lost track of where I am in this challenge. I didn't submit anything by Sept. 14, so I assume I've used one joker? I also may not be able to get anything in time for October.. unless the September due date is October.. I forget how this works.. I know I submitted the required amount in August.. I'm a little lost. How many months have we done so far? Either way, I hope to dive back into this with a fury. I've got my sorcerer primed and 5% painted and I've got other big things that simply need to be primed! Hope to update soon! A new update! Well over 150 points done for this month of October... I'm working myself towards earning a third joker at this rate! That puts me at... if my numbers are right, 533 out of the total 1300 that I intend to do for this challenge. I'm almost at the halfway mark! I still have 4 more daemons and 2 more obliterators, along with my Daemon Prince, a Rhino, a Defiler, and a Land Raider to go. All of those are huge steps worth a whole month on their own. I hope to get the daemons, obliterators, and the rhino done sooner than later so I can get all the littler things out of the way and spend some real time on the big ones.